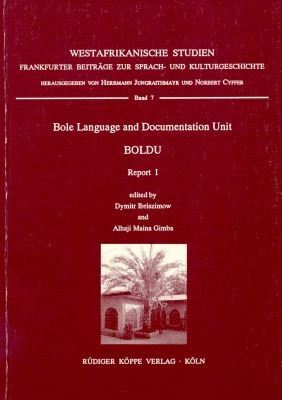 This volume is a preliminary report of the Bole Language and Documentation Unit (BOLDU), whose aim it is to gather, analyse, perserve and publish everything connected with the language, culture, and history of the Bole people in north-eastern Nigeria. Part I is devoted to some of the crafts in the Bole region of Yobe state. The authors, being both linguists, concentrated on the Bole crafts terminology. Part II consists of an article on the physical geography of the region, an article on Fika urban geography and a contribution to the study of the toponyms of the region. In Part III, the yet unpublished Guide to the Potiskum Museum is presented. It is accompanied by a Catalogue of the Artefacts in the Museum. At the end of the volume, a Bole-English glossary is appended. The book under review which consists of 'preliminary working papers' (as it was stated by the Editors) is a multidisciplinary attempt at exploration of [the] cultural past and presence of the Bole people. It provides a rich documentary material to further studies of this kind. It discloses the unwritten testimonies of the African past and changes them into the documents and sources.